Corset: Base by Pop Antique with Dark Garden; embellished by Sparklewren, Karolina Laskowska, Neon Duchess, and Laurie Tavan. Model: Victoria Dagger. Photo © Stereo Photo Album. Of course, that's not to say there is no learning curve for self lacing! It requires a bit of dexterity. You need muscle memory as well as a little bit of strength and flexibility to make it happen. There are a few factors in the corset itself that will affect how easy or hard it is to self lace. First, the shorter the corset, the easier it is to lace. 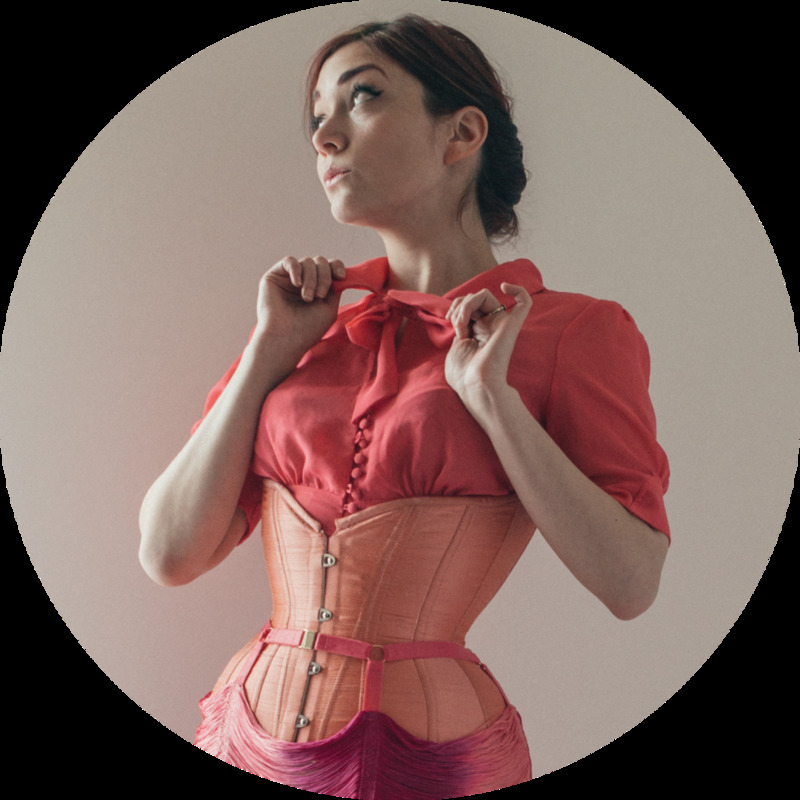 A standard underbust is easier to lace than something which goes above bra band level, as you don't have to contort your arms as much to access the lacing. X pattern lacing seems to slide more easily than V/chevron lacing. Satin ribbon slides about 10x more easily than shoelace-style cotton lacing! I find this particularly true when unlacing. And, yes, the satin ribbon is plenty strong and will stay tied snugly all day. Lastly, you may want to avail yourself to the doorknob trick. Simply hook the waist loops around a doorknob and walk away, with the doorknob holding the laces taut as you tighten. This keeps the lacing from sliding back as you move to tighten a different section!